Get your SPOOK on with our annual Vampire-O tradition on October 29th. 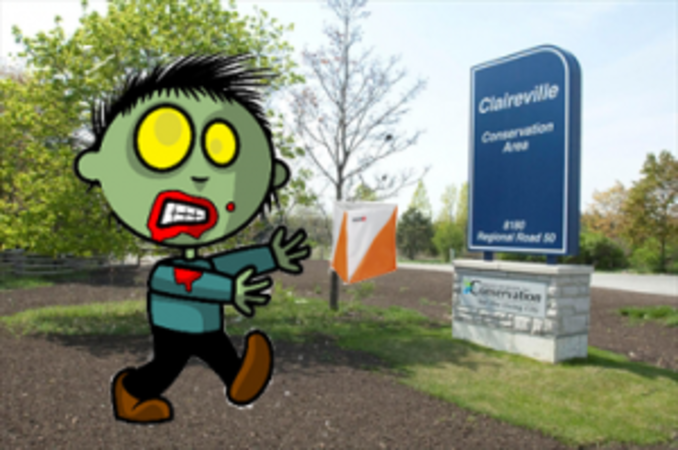 It’s a family-friendly journey through the woods of Claireville Conservation Area (just off 427 N of the Airport). We’ll give you a map and it’s up to you to navigate and find as many checkpoints (and avoid zombies!) as you can in an hour in the dark. FAMILIES: It’s a great evening of halloween themed fun for families. Costumes encouraged to scare off Zombies. ORIENTEERS: Grab your headlight and get yourself some night nav practice. It’s a real Score-O course on a real Orienteering map. Time: 6 PM- 6.45, There will be a limited number of maps available for event day registration. Register online to guarantee your spot. Take the 427 North to Highway 7. Go west(left) on Highway 7 to Highway 50. Turn south(left) on Highway 50 and travel south for about 1.5 km to the park entrance on the west(right) side. Enter the park and follow the signs to the parking area. Please drive slowly and carefully. We will use the Traditional Score-O format: 1 hour time limit, in the dark, hunted by the undead. Post-panic, we will be pleased to offer you small treats and warm drinks. Please call ahead with your preferred blood type. Just because we're monsters doesn't mean we're uncivilized.